would find this whole thing stupid and childish. feel like she still owes you something? But you weren’t paying attention. I haven’t thought of OMGWTF forever and then an old thread about her came up on the main forum where she got stiffed way back years ago in a money match at Hard Times. So I thought I would check out her blog and that’s when I saw her trashing me. Using your logic, she sat on her feelings for five long years so she must be the one lying. I am telling my side of the story. Ok, now you can be done, yes? Oh come on now CW you know how I like to burden you with my point of view. She is healthy now after all these years...financially, physically and mentally. "...People who want to tell my story keep emphasizing that I was, or should have been, afraid of losing. I don’t know why they do that. I don’t know why they insist I should have been trembling, wracked with doubt, terrified of repeated failure. I had nothing to lose. I already had everything I wanted. Four years ago, I thought winning this tournament would make my life better, but really, it was making a better life that allowed me to win the tournament." Anyone who has read Melinda's writings knows that, on a scale of 1-100, she gets full marks in the credibility department. My take on her has always been that what she writes is consistently, brutally, cut-to-the-bone honest, even when it's at her own expense. Everyone can make up their own mind, but in this case, I would suggest it's pretty easy to figure out whom to believe. Dude: you would be the last one to know the skinny. Come on down to Santa Monica. Caucus with the rail. I know you talk tough but you slinked out of any real action in my hood. OMGWTF is a key board bully and when bullies and liars are confronted they fold. She has kicked around many folks and they've put up with it. Homey don't play that sh...t.
Listen if you come to LA we can make up a game but I don't have any talent for the game just like OMGWTF, and you will have to give up some weight, seeing you have such extensive skills. But I don't want to play cheap. Lou was the guy tawkin sh...t.
You were mentioned briefly in a very long, very boring, ego driven blog that was written six months ago about something that happened five years ago, read by few and recalled by even fewer. Can't fix stupid, you're on your own. Peter Griffin: "OH MY GOD WHO THE HELL CARES?" I got beat by Jenny Lee in 2013. I got beat because she is phenomenal player and gambler. When I complained about her sharking after the match was over to two women pool players (one a longtime professional) I greatly respect, they shrugged and told me the hard truth: "It's just what she does." Basically, if I agree to a match with her, it comes as part of the package and you just deal with it. The blog post I wrote details the defining moments that changed my game for the better. In 2013, I thought sharking was unfair and total BS. In 2018, I accept that sharking is part of the game and I work to have the mental fortitude to not let it affect me. The Jenny Lee match was an epiphany and the biggest contribution to my improvement as a player. 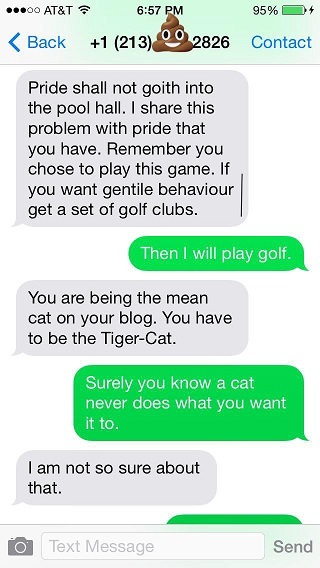 I've posted some screenshots below from Ian Campbell. His writing style is very distinct. My comments are in blue. Sorry it took so long to respond, I was out of town. I hope you don't mind but I've condensed three of your posts together. I haven't edited any of your statements or corrected the spelling errors. I grouped the statements that seemed to fit together best. I also blocked three digits of your phone number, but if you want me post the unedited version, just let me know. Bill Clinton is fond of saying, " that all the greatest wounds are self inflicted ". Or put another way " pride goeth before the fall ". Is it possible I called her a kitty cat? Is referring to her as a kitty cat a crime? You all know how Persian cats meow all the time complaining, that's her. Its been five years ago like you said and I can't remember what I said last week much less five years ago. If you were setting up a match for a guy, I am sure you would not have referred to him in such awkwardly adorable terms. If everything was only about pool (as I thought it was), you would not have referred to me that way. We were not friends then and such familiarity is out of place. She let her ego ruin her chance to win the match. I called her before the match went down and and told her, it was the common consensus that she needed to receive at least the call 8. I have played her opponent over the years many times and knew her game inside and out. I knew that her opponent would not want to give up the weight but felt since, I was putting up the money and she had nothing to loose, that she would agree. Your own post on AZ shows you were not going to give me weight even though I asked for it. When you called me, you said Jenny wouldn't give me weight but you could "force" her to do so. I said you had already made the match and to change the terms now would be unfair, and I also did not like the idea of you forcing anyone to do anything. I said it would be very hard for me to win but was up for the challenge. 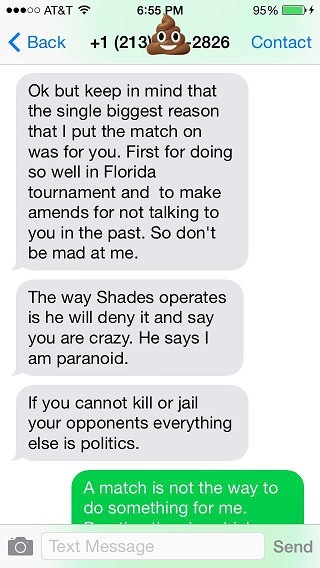 I also had to pick up some of her opponent's practice time when she found out I was subsidizing the broke OMGWTF. 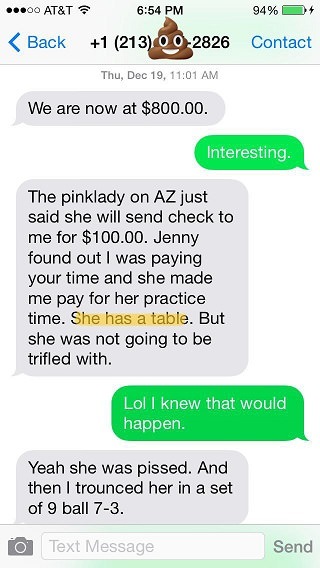 You forgot to mention Jenny has a table at home. She doesn't need table time. 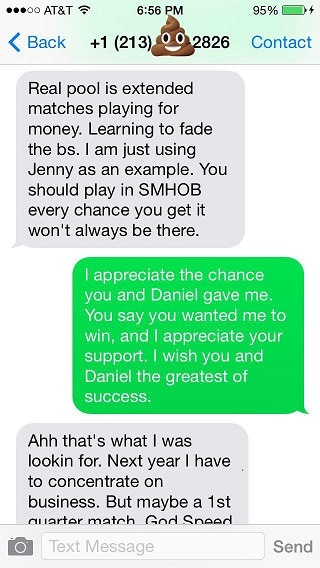 Since I paid back the table time you paid for me, I hope you were able to get the money back from Jenny as well. She says that the match was unfair because a friend of her opponent's was in the audience. I was there at the match and this is not the reason she lost. She lost because she played a better player than her, without the weight that was offered her. 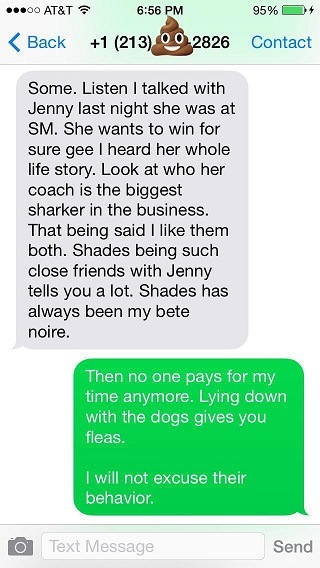 So this is really interesting because you told me she sharks and her friend Danny Shades does as well. You actually confirm this to me before the match and you even say her husband (pretty sure that is her coach) is the biggest sharker in the business. 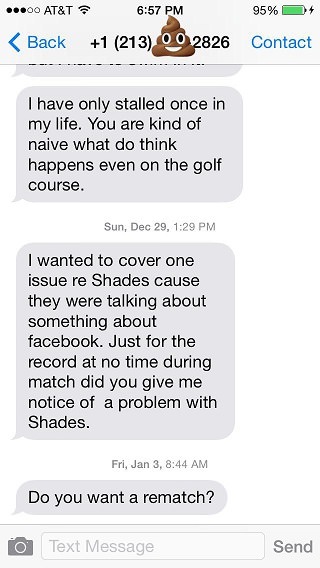 Your comment about Danny Shades was interesting. A "bete noir" (French for "black beast") is defined as "a person or thing one particularly dislikes." It seems you loathe and despise the people you call your friends. You told me the majority of them are "uneducated suckers" who don't know how to make a profit at pool like you do because you are a "revenue player". There was a player (you said he was a Presbyterian--why was this detail relevant) who likes to play even with great players--he was a sucker for throwing his money away. That same player had a close friend who routinely steered these champions to that player specifically to take his money. You thought that was sleazy but clever. 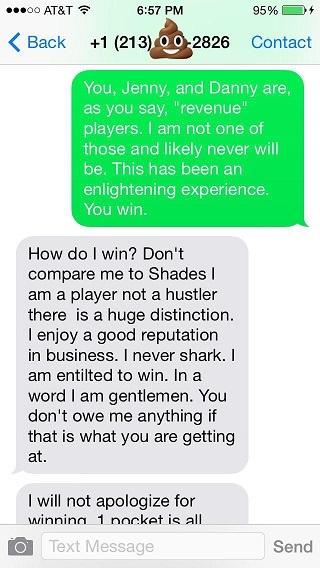 Here are some more texts after the match where you acknowledge the sharking. 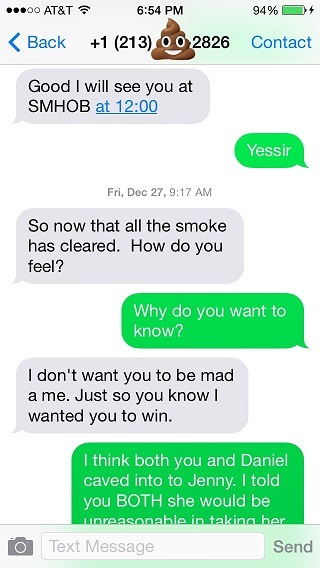 Again, it's interesting you thank Danny Shades publicly on AZ and then tell me it's just "diplomatic smoke." 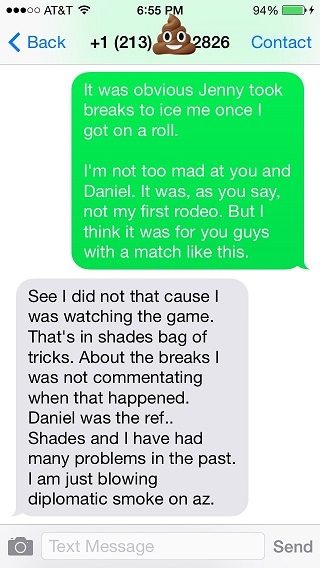 I actually talked to Danny directly about this I think a year or two after this match. He remembered the moment he stopped right in my line of sight and asked if it had sharked me and I told him the truth: that I had been distracted, but that was on me--it was something I needed to learn how to handle for myself. Danny is as Danny does and I haven't spoken to him since then (although I see him from time to time on the bus) but I don't bear him any ill will and think his macrobiotic diet is probably something I should look into so I can live forever. The "not talking" confused me because I don't remember having a reason to talk to you. I certainly did not notice you NOT talking to me. You were originally a Hollywood Billiards regular before it closed and I would not have known you on a personal level since I live quite far from there and do not drive. You say you wanted me to win, but the neat thing is, you had also told Jenny's husband you wanted her to win. He did not trust you. It's cool, though. You had to hedge your bets. At this point, I realized I was just done with it all. I didn't want to be a "revenue player" and I figured I'd just sign off politely and focus on fixing my life. After loosing, she acted like a spoiled child. She says she wasn't compensated. The spoils went to the victor. OMGWTF is not Willie Mosconi he is the guy that got paid for exhibitions. I think you misunderstood why I wrote I wasn't compensated. I had taken a day off work, unpaid, to play the match. If I lost (which I did, of course), it would actually be negative on the day. Losing would result in a real, monetary loss. The point of including that was to show how deep I was into pool that I would make such bad decisions. That was the absolute bottom and also the turning point for me, my career, and my pool game. At no time did I think I was Willie Mosconi. This gal should thank me and she is acting very badly. Her opponent took the $900 prize fund and didn't tip Daniel of POV Pool one dime, which was, not cool. I never have had any ambitions to be a streaming entrepreneur. This is made up out of whole cloth. If I remember correctly, you asked for someone else to step up and play Jenny after I lost. The woman who volunteered was an excellent player (she still is). I heard Jenny asked her for weight (hilarious). That's when you said "I don't think the 'Don King' of pool would have Jenny play that big bull-dyke looking [name redacted]. In our conversations you are incredibly intolerant. I hope that has changed since then. 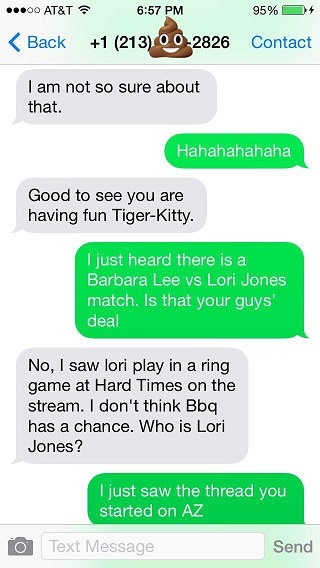 It's also hilarious that you ask if I want a rematch after that. I can't fault your point of view but the fact is, that the Pool community in S. California is not that large. We all know each other. I am one in a long list of folks she has gone off on. WADR respect you all don't play in our pool hall. I have been regaled with tales of woe about her behavior. She ain't popular at all where she plays pool. In fact I would call her flat out anti-social. I am a real believer that what happens in the pool hall should stay in the pool hall. I don't really write about players or folks in my pool hall for the most part. I've made this exception because she is always hauling out folks for sessions of public humiliation and upbraiding. You don't write about players or folks in your pool hall because you don't write at all and the pool hall is generally uninteresting. Thanks for being open about your thoughts, though, because doing so allows me to be open about mine. I find it interesting you really, really, REALLY need to convince people I am universally hated. I think that is because you yourself value validation from others so much it is natural for you to think others value it on the same level. You don't have to convince people I'm not liked, I am sure people know. I don't think you realize pool is not a popularity contest for me the same way it is for you. I think that is why you are so two-faced. You despise the people you hang out with but you also don't have the courage to NOT hang out with them. I can only imagine the enormous pressure and loneliness you feel and you have my sympathy. When you spoon feed a spoiled child and then they try to smack you from their high chair and then they segue into prevarication, you have to fight back. Dude. You are publicly condoning child abuse and talking about fighting a baby. She is a social retard and an internet extrovert. The gal she played in this match plays everybody in our pool hall. OMGWTF doesn't play anybody. I guess back in the day she played in the league. I am not a league player. I am a one pocket player. I don't know why it is significant that I don't play people in this pool hall. As you just said, you play one pocket. So does everyone else. I don't play one pocket so I have no reason to play any of you. Most of my play these days takes place outside of this pool hall. I just come in to practice. I think of the pool hall as a gym. I like to come in, work out, and leave. I am not there to specifically make friends although I do like to chat with the ones I run into after I am done with my workout. Now if you are a world champion and possess the temerity to give OMGWTF any advice, watch out, she will go ballistic. She has never come to grips with the fact that most champions are mentored by great players and Tiger Woods still has a swing coach. Do you know that no world champion has ever given me unsolicited advice? World champions know how good they are so they don't sweat what other people think. You are mad I don't want you as a coach because you see it as a direct insult to how good you think you are. But really, A LOT people have known for almost 20 years I don't have a coach because I want to be self-taught. She kind of brings to mind Mao's fourth wife, the actress Jiang Qing that ruled over a reign of terror in the infamous " gang of four ". That's the vibe she gives out, she wants to put dunce caps on all of us and hang signs on us, telling everybody we are traitors to her cultural revolution. I don't know if you did this on purpose but I'm really glad you chose a Chinese person to compare me to and not another Asian ethnicity. Thanks for doing your research. Just to prove I don't have a heart of stone, I would like to congratulate her on winning the national amateur championship. But is she hot? And what kind of tip does she use? I look the way I play: average. I use Kamui Black Soft tips. My favorite tips of all time are the old (15+ years ago) Moori Medium tips. They played so well. The later Mooris are just not the same and I miscued a lot with them (some of them glazed over too easily with the thicker glue layers) and the closest I have found are the Kamuis. I see there are a lot of new tip out there but I generally like to stick with the tried and true. Thank yall for coming out, God bless you, Goodnight.